It’s been one week since our Mass Effect 3 demo became available and everyone at BioWare is incredibly pleased with the response. If you haven’t already checked out our single-player and multiplayer demos (the latter is completely spoiler free and a bit addicting! ), I suggest you try them to see what all the fuss is about. Our development team worked hard to ensure that Mass Effect 3 is available at the same time for PS3 as it is for other platforms, a development milestone we’re happy to celebrate with the PlayStation community! Today, I want to let you know about an exclusive offer for anyone who pre-orders Mass Effect 3 via the PlayStation Network. When the PlayStation Store updates later this afternoon, you’ll be able to pre-order to download a digital copy of the game (available 3/6 in the US) and receive the M55 Argus rifle to complement your in-game experience. The Argus is a high-powered rifle and an excellent close-range weapon. Its bursts of fire ensure ammunition conservation during lengthy conflicts. Law-enforcement agencies across the Mass Effect galaxy are adopting the Argus as their standard rifle, as much for its intimidation factor as its suppression power. Along with that in-game bonus weapon, Sony Computer Entertainment America and BioWare would like to offer you a special Mass Effect 3 PS3 theme—only available for digital pre-orders. Once the game has launched, these offers will no longer be available, so if you haven’t done so already, secure your copy of Mass Effect 3 later today when the PlayStation Store updates and prepare for the Reaper invasion! 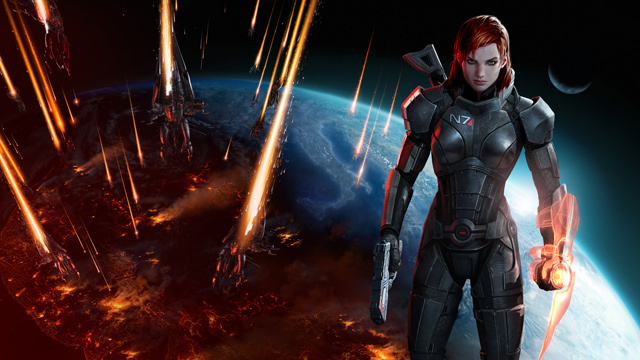 Let us know what you think of our pre-order offer and the Mass Effect 3 demo on Twitter! Thanks for bringing this franchise to PlayStation guys :D, i love Mass Effect 2 ( at the moment trying to finish all side stories for more trophies to unlock ), once im done with Mass Effect 2 will pick up Mass Effect 3. amazing series thank you! I already preordered the CE (I want the robot dog). 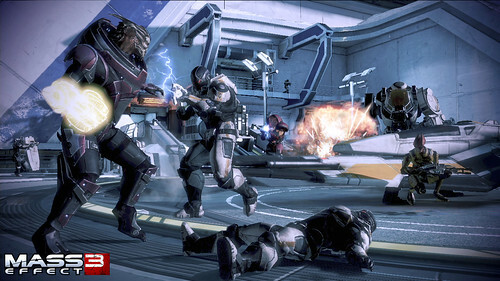 Any chance the previous Mass Effect games will be released for us PS3 owners? I know these were Xbox exclusives but I’m just wondering. Having never played a Mass Effect game I would like to have the opportunity to play the first ones first. There aren’t any announced plans at this time, however the team worked incredibly hard to make sure that new players wouldn’t be left out. If you don’t import a saved game, the beginning of Mass Effect 3 will catch you up on what’s happening in the galaxy. Personally, I played ME2 before trying out ME1 and if you love ME3, you can definitely go back and try the previous ones. thats pretty cool but not picking it up on release. maybe when best buy does a price drop they always do it for new realeses. but it takes like a month so ill probably get it there , plus i barely bought the 2nd one , but not really digging it so far, but ill give it a try never was a fan tough. @angibri2000 Mass Effect 2 was released on PS3 (digital and retail) about a year ago. It’s about $20 retail right now as well. Mass Effect 1 will never come out on PS3 because it was published by Microsoft who issued a statement that ME1 will always be a 360/PC exclusive around the time ME2-PS3 was announced. 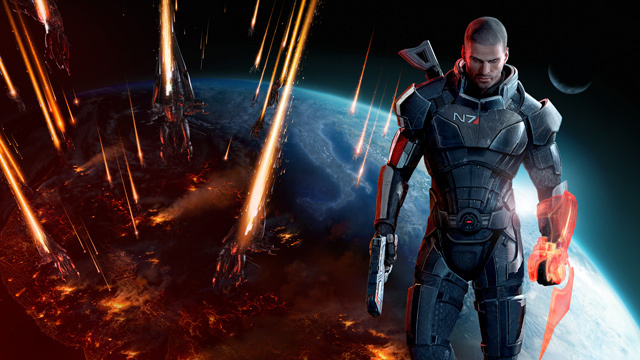 Mass effect is an awesome series! cannot wait to play the full! So, how about that digital discount for a large file game such as this? Glad to hear you’re excited!! I’ll buy it if the reviews say that the frame rate issues in the demo have been resolved in the retail copy. I agree guys, the frame rate was pretty awful in the demo. The lack of screen tearing was nice though! Are we going to be able to download the whole game prior to launch but just have it locked? I’m sure it’s going to take a long time to download and wouldn’t like waiting for it. It’s great to have a big title available for digital download from launch. I just hope it’s not available to download when the store updates later that night when it should be available at midnight to compete with retailers. Are you guys honestly complaining about frame rates in a demo?…It was a demo, the final copy won’t be having those issues. It’s very difficult to take a sampling of a full game and make sure it doesn’t have minor issues such as frame rate issues. It’s nice to see that some games aren’t even getting retail versions released before the digital copies are announced. Wouldn’t have purchased half my games via retail if I had access to a digital copy first. i tought it was my TV since its a 480 p or i with the framerate issues but still i need to upgrade. $49.99 or $59.99 for a Digital Copy of this game??? Thanks. Fallen, your TV will never cause framerate lag just for being 480i or 480p. If anything, games would run a bit better. @14, apparently you don’t know much about the development cycle. Unless that demo was running an early build of the game (which is possible but not a smart move), it’s going to be like that. I mean sure they could turn on a V-sync but yea. Take it for what it is, the release isn’t “months” away. @15 Resolution is irrelevant to frame rate on your or your tv’s part. Link, Kingdoms of Amalur had a demo released for it about a week or two prior to release. The gameplay was horrendously glitch-riddled. Frame rate was poor most of the time, the ground vanished randomly, all sorts of clipping issues, etc, etc, etc the list was a mile long. The game was released and there wasn’t a single issue with the game. The fact of the matter is that a complete game (the game you’ll get via digital download or your retail copy) has all of the files required to play the game correctly, it isn’t missing anything. A demo is simply copied code put out for early access, you don’t gain access to the full game or even the current build of the game as a result. I suggest you test out more demos if you honestly believe a glitchy demo means a glitchy game. I nabbed the ME2 platinum trophy not too long after it released (bought it Digital), and I’ll be doing the same for this one. I hope to see some Mass Effect avatars and Dynamic themes on the PStore shortly after release too. I hope you guys do this! And since I won’t be getting the digital version this time around, I can’t get this theme you’re going on about. I’ve had my N7 Edition pre-ordered for PS3 for ages, and I just recently pre-ordered another copy VIA Origin (Digital Deluxe), since I also plan on continuing my PC game save after I finish it on PS3. Then I’ll be MP hopping on PS3/PC. You guys should have made it cross platform between PS3 and PC like Valve did for Portal 2! Really awesome and I hope more games do this! Any chance that the theme is dynamic? would be awesome if avatars were added on for the pre-order bonus as well. Tempting, but I’ll take the physical copy. I’m not made of hard drive space. Ill be preordering this soon I want to support digital distribution of games like this. I cant stand Gamestop and I usually buy games digitally nowadays so this is too awesome! i already preordered the ce but i’m just wondering, will this come with the preorder weapons from retail? I actually changed over to the PS3 because of the addition of the ME series since it is my all time fav. Too bad I already had the CE pre-ordered for PS3 since they started pre-orders nonetheless great theme. Any chance that it would come available to PSN after a while. See…I was one of those guys that pre-ordered the CE (I’m not passing up the robot dog). This is where you make super vouchers for the CE guys *sigh*…Oh well. That’s a pretty cool offer!! Good job Team BioWare!! CE pre-ordered and PS3’s HDD is almost full, so I’ll pass on this but I’d like to see more games being sold digitally same day as boxed copy. I don’t get the pre-order digitally thing, It’s not like they can run out of copys, can they? best to give everyone the bonus content with all digital copys to make up for not having the blueray, box, manual, etc..
Also for the ones that do pre orders through gamestop and other ways would the perks be a DLC in a later date?? Are you kidding me? Xbox360 gets all that Kinect stuff and all PS3 gets is a bloody theme, and the choice to buy it, probably more than retail price, digitally. Not to mention it would probably take a fair few days to just download it. No thank you. I Bought my ME2 digital release, and now I’ll do the same with ME3. The will cost $59,99 right?? I’ve also pre-ordered the N7 Collector’s Edition from Gamestop so that I’ll be getting much more DLC than just the M55 Argus rifle. 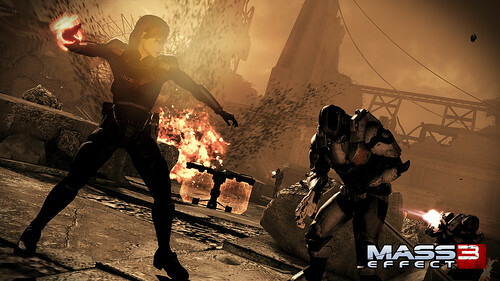 3) Shepard would sometimes get stuck at the edge of an area & the only way to continue was to reload from the last save. It’s a nice offer but I’ll stick with a retail physical copy so I actually get to own the game and could play it 10 years from now if I choose to. I suggest everyone do the same and don’t get a digital copy just for a single rifle. How does your game take advantage of my PS3′s unique abilities? such as utilising its superior Bluray drive or maximizing it’s Cell Broadband Engine? If I decide to buy this on PS3 (Ill be upgrading my hard rive soon anyways!!) I will definitely buy iut through psn I like buying games digitally cant wait until all games begin being released this way. WHAT!!! THANK YOU SOO MUCH FOR THIS DIGITAL 1st DAY RELEASE!!!!! i was really hopping it come true! i’ll get 60$ cards right now!! As a PS3 user who wants a total immersion in game and out of game,I wish you would have chosen PS Home as part of your marketing. A space designed like the ship in the game with an interactive UI for game launching and Home unlockables with outfits from the game would have made a fan like me become totally punch drunk in anticipation. So when is the PlayStation Eye getting Voice Command Support for Mass Effect 3? Ahh barnacles… would love that theme, but I already have it preordered through Amazon and I am a dinosaur (and killer of the environment) and love my game cases. Hot d*amn, this is good news. Sorry, GameStop, getting digital wherever I can! How many GB is it please….? I’m assuming since Mass effect 2 was about 12GB this will be around the same..?? And isn’t the Argus available when you Pre order the Disc version?? Just want some clarification. What time the update will be on air today? the size of Mass Effect 2 was 12GB. what is the file size?